Détails sur Men's Rogaine 5% Minoxidil Hair Regrowth Treatment Foam - 3 Months Supply - NEW! 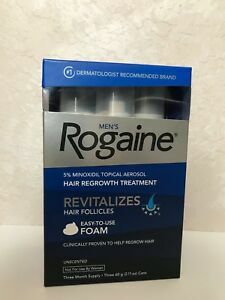 Men's Rogaine 5% Minoxidil Hair Regrowth Treatment Foam - 3 Months Supply - NEW! MPN: 5278135 Size: 3.5-7.9 oz. Gender: Men Return Policy: Must be in exact same condition as received. The Rogaine Men's Rogaine Unscented Foam constitutes 5 percent of Minoxidil, and regenerates hair follicles. This foam is scientifically proven to help regrow hair, when used every day. It is easy to apply and dries quickly. In addition, this Rogaine foam for men is a FDA approved product. Le paiement immédiat de 49,95 USD est obligatoire.